Founded in 1982, NEDIS is one of the Europe’s market leaders in consumer electronics. NEDIS offers huge variety of different types of cables, connectors, battery chargers, active and passive transmitters and switches, audio and TV accessories, multimedia, lighting and many others. 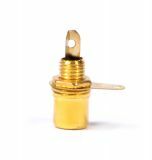 The company exports all over EU and is favored for its quality and reliability. VIKIWAT Ltd. sells successfully NEDIS’s products on Bulgarian market from years. Electric mosquito killer lamp INKI110CBK18, 18W, 230VAC Electronic insect control device covering an area of ​​up to 150 m2, power 18 W and power supply 230 VAC. Electric mosquito killer lamp INKI110CBK16 2x8W, 230VAC Electronic insect control device covering an area of ​​up to 50 m2, power 16 W and power supply 230 VAC. Electric mosquito killer lamp INKI110CBK4 4W, 230VAC Electronic insect control device covering an area of ​​up to 30 m2, power 4 W and power supply 230 VAC. 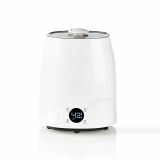 Humidifier 5.5l HUMI120CWT, hygrometer, LED display, timer Air humidifier with 5.5 liter tank. The device has a hygrometer, LED display and timer. 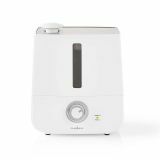 Humidifier HUMI110CWT, 2.8l 2.8 liter air humidifier and humidity control. 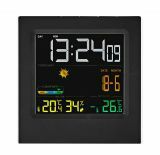 Weather station WEST403BK indoor and outdoor temperature, -30~60°C, wireless sensor Weather station WEST403BK with thermometer, hygrometer, clock, alarm, calendar, backlight and wireless connection with external sensor. The weather station can be received with batteries or an adapter included in the kit. 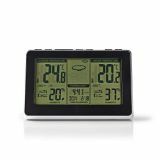 Weather station WEST402WT indoor and outdoor temperature, -30~60°C, wireless sensor Weather station WEST402WT with thermometer, hygrometer, clock, alarm, calendar, backlight and wireless connection with external sensor. The weather station can be used with batteries or an adapter included in the kit. Weather station WEST405BK indoor and outdoor temperature, -30~60°C, wireless sensor WEST405BK meteo station with thermometer, barometer, clock, alarm, calendar, moon phase indicator, and wireless connection to external sensor. Weather station WEST404BK indoor and outdoor temperature, -30~60°C, wireless sensor Weather station WEST404BK has basic meters such as a thermometer and hygrometer, but also other features such as an alarm, calendar, backlight, and Wireless sensor. Weather station WEST401WT indoor and outdoor temperature, -30~70°C, wireless sensor Weather station WEST401WT with thermometer, hygrometer, clock, alarm, calendar, backlight and wireless sensor. The weather station can be powered by batteries or the adapter included in the kit. Thermometer digital PETH110DWT, contact, 34~44°C, display Digital contact thermometer for body temperature with display, sound signaling, range from 34°C to 44°C and white color. 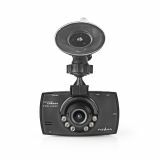 HD portable car video camera with 2.7-inch display, Full HD 1080p, 120° Full HD video recorder, 120° viewing angle, 2.7"screen size and power from car lighter. 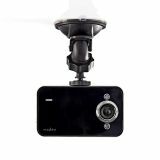 HD portable car camera with 2.4"display, HD 720p, 40° Video recorder with HD resolution, 40° viewing angle, 2.4" screen size and power from the car lighter. List Price 0.95лв. VAT Incl. 0.85лв. VAT Incl. 0.80лв. VAT Incl. 0.76лв. VAT Incl. 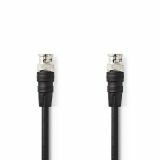 Cable for security camera BNC/m-BNC/m, 2m Cable with connectors from BNC/m to BNC/m, 2m. Adapter HDMI/F - micro HDMI/M, 4K, 0.2m, black High quality HDMI - micro HDMI adapter (female / male) with gold-plated tips, support for 4K resolution and 0.2 m long.